If you are thinking about becoming a parent you are probably curious about your entitlements to various types of parental leave and how they may affect your employment. In addition to wondering if you will ever sleep again, you may find yourself asking questions such as: what are the differences between maternity, pregnancy, and parental leave? How long can my partner and I take off work? what are my legally guaranteed employment rights? This post will give you a basic overview of your employment rights as new or expecting parents. Starting or expanding a family can be an exciting and stressful time. The rights set out under the Employment Standards Act are designed to help parents leave and re-enter the workforce while welcoming their new bundle of joy. It is important to note that the rights of employees of federally regulated companies (such as banks and airlines) are somewhat different from those regulated provincially. This post focuses on the rights of employees of provincially regulated companies. To start, pregnancy leave and maternity leave are one and the same. Pregnant women are entitled to a maximum of 17 weeks unpaid leave from work starting as early as 17 weeks before the baby’s due date. Parental leave is available to any new parent (adoptive or natural mothers, fathers, and individuals in a relationship with a new parent intending to treat the child as his or her own). Parental leave can last up to 35 weeks for birth mothers who have also taken pregnancy leave and 37 weeks for other parents. Between two parents, pregnancy and parental leave can last up to 52 weeks. Birth mothers must start their parental leave as soon as their pregnancy leave ends. Other parents must start their leave within 52 weeks after the child is born or placed under their care for the first time. You are entitled to take either parental or maternity leave whether you work part-time, full-time, or on contract. However, you must have been hired at least 13 weeks prior to you or your partner’s expected due date and you must give your employer two weeks written notice prior to the start date of your leave. Your employer cannot tell you when to start or end your leave. However, if you return to work before 37 weeks, you have forfeited your right to the remainder of your leave. Both pregnancy and parental leave are unpaid. 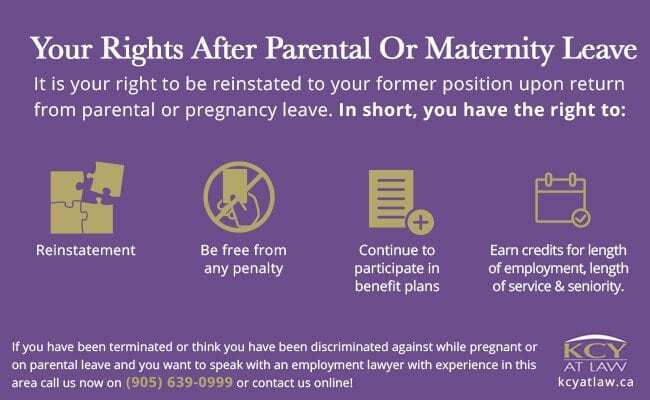 It is your right to be reinstated to your former position upon return from parental or pregnancy leave. If your position no longer exists, you must be offered a comparable position with the same benefits, wages, and location. If your job’s wages increased while you were on leave or would have done so if you had not been on leave then you are entitled to that higher wage upon return. As a person on pregnancy or parental leave you are still entitled to participate in various benefit plans and your employer must continue to pay their share of premiums during your leave. Your seniority and length of employment continues to accumulate during periods of leave. earn credits for length of employment, length of service, and seniority. Your employer can never fire or deny you opportunities because you are pregnant, have taken or plan to take pregnancy or parental leave. However, his does not mean that you are immune from wrongful dismissal when you are on one of these leaves. Job Termination While Pregnant or on Parental Leave? 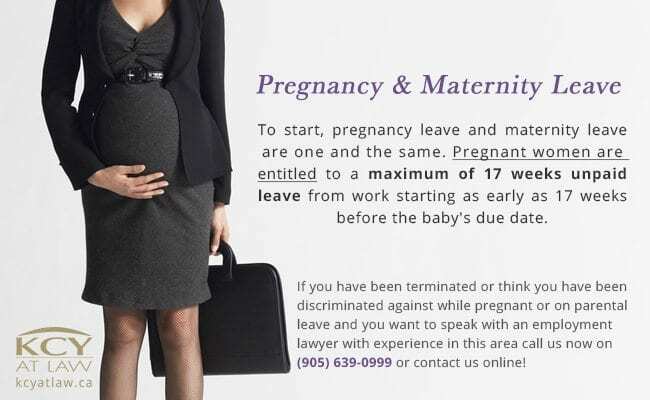 If you have been terminated without cause while pregnant or on parental leave, or if you think you have been discriminated against for taking a maternity or parental leave, and you want to speak with an employment lawyer with experience in this area, call KYC now at LAW at (905) 639-0999 or contact us online to book a consultation. Can You Sue The Good Samaritan? Termination Clauses: Could a Promotion Decrease your Severance Package?